The four-bedroom house has a garden but "lacks charm"
An ex-council house in west London has gone on the market for £895,000 - and it is a bargain at the price, according to estate agents. The unremarkable end-of-terrace Chelsea property, the freehold of which was sold in 2000 for £50,000, is on Fulham Road, a shopping and dining Mecca. "It is relatively cheap because it is ex-council," said agent Tom Gow, who is handling the sale. Past neighbours have included Robbie Williams, Liz Hurley and Leslie Ash. Other properties in the area sell for £2m, but the price of the ex-council house is seen as an example of the difficulty faced by first time buyers. Mr Gow said it lacks some of the charm of a Victorian house but it is still a "quite nice four-bedroom house". "If people are going to spend close to £1m in their minds they do not want to be living in an ex-council house but there is something there and they will be on to a bargain," he said. "The reason people are attracted to this over other houses is the price, because you are getting good value for money." Previous owner Robert Goodall, who grew up in the house, bought the freehold on the property from Kensington and Chelsea local authority in 2000 after the present government gave homeowners' the right to buy. 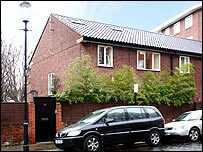 He revamped it by creating a kitchen/diner and converted the attic into a fourth bedroom before selling it for £750,000. Mr Goodall had inherited the house from his father, Raymond, who bought the lease from the local authority in 1972 for £15,300.